The Ateneo de Manila Blue Eagles beat the De La Salle Green Archers in yesterday's show-stopping game at the Mall of Asia Arena. But we're not talking about basketball stats and rankings here—we're putting our focus on (hopefully) one of the Loyola Schools' future students: Scarlet Snow Belo-Kho. 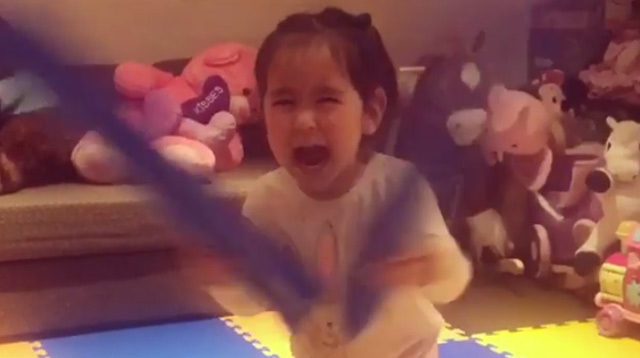 Straight after watching the game, Cristalle Belo brought home a pair of balloon clappers for her little sis to play with and even taught her the school cheer "One Big Fight." But what she didn't expect was for Scarlet to turn into one suuuper intense Ateneo fangirl—as seen on a video Cristalle shared via Instagram. Writing on the caption, she said: "@frankbriones and I brought home the balloons for @scarletsnowbelo and told her about watching the basketball game and cheering ONE BIG FIGHT! So she started cheering na din." ICYDK, both of Scarlet's older siblings are proud graduates of Ateneo—with Cristalle and brother Quark Henares earning degrees in BS Management and BS Management major in Communications Technology, respectively.